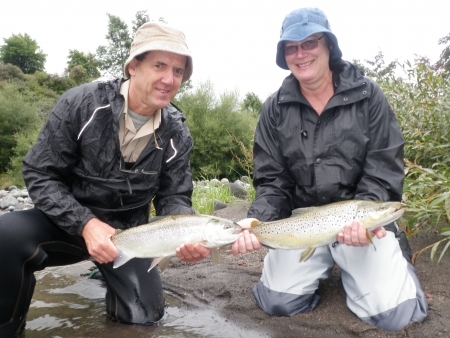 All rivers are fishable and fishing reasonably well most days with the Tongariro receiving plenty of small runs. Angling pressure is high but dont let this minor in convenience put you of from visiting our rivers at the best time of year. I was out guiding two different groups today and found fish in both the morning and afternoon sessions by fishing the same beat on the Hine. The Hine is due to slow down any day as I think it has seen it’s best runs over the past two months-what a season it has had. The Tongariro should step in it’s place and stand up as king of all rivers in the coming weeks. Sorry to say it but there will be no website report for the next few weeks as the website is having some maintenance and up grading done to it. I am also letting my hair down and escaping for this time but we will back and live mid way through next month. Thanks for all your support and following over the past year it is a pleasure to write reports and feature my friends/clients on a daily or weekly basis. Without the readership I have there certainly would not be a report and it is great knowing that my efforts are appreciated by most. Log in again soon!! !